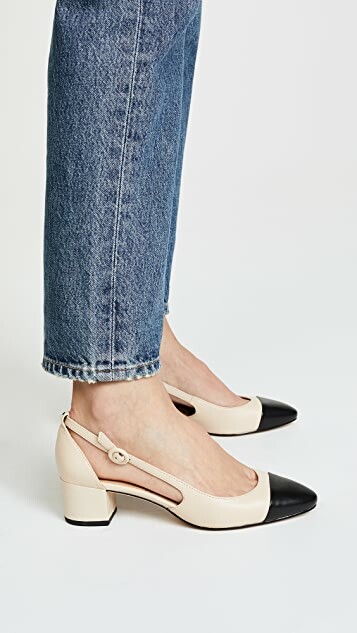 A definite contender for your 9-to-5 and beyond, these Sam Edelman pumps pair a modern, block heel with a retro-inspired toe cap for slingbacks that are both elegant and easy-to-wear. Talk about a win-win! Elegant but larger than expected. I bought it for everyday workwear. It goes with every pair of my pants and every shirt. Looks elegant and low-key. However, it is larger than I expected. I usually get a 7 in Sam Edelman and I have a wide feet. My feet were lifted out of the heels and the back strap cannot hold it. Feel hard to walk so I have to return it and get a 6.5. Cute, comfy, but I had to order a 6.5 instead of my usual 7. I've bought more than 3 sam edelmans before and this is the first time it's too big and uncomfortable. The heels are painful despite they are block heels and the square toe are not comfortable either. I wanted to love it so much and but had to give up. 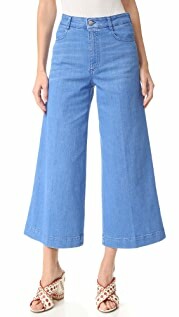 I SO wanted these to work! These "looked" like the perfect shoe for spring and I've had good luck with Sam Edelman pumps. 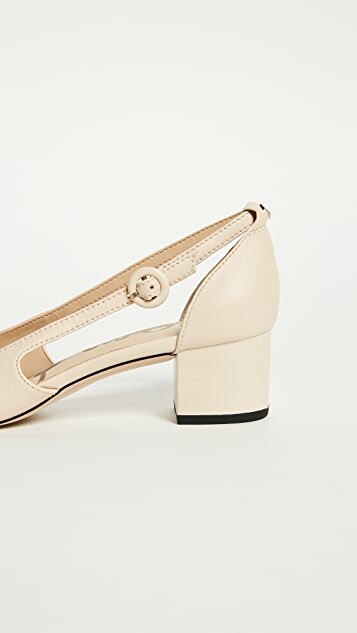 (Not their booties, however) I ordered my true size 8.5, but my toes were cramped and my heel lifted out, despite having the adjustable strap at the tightest setting. I can't go a size down as lengthwise it was right, and sizing up for the toes would make them too big. The narrow heel happens as we age, so these are best for for youthful wearers. The back tie near the heel is a bit uncomfortable. Otherwise it is good pair. 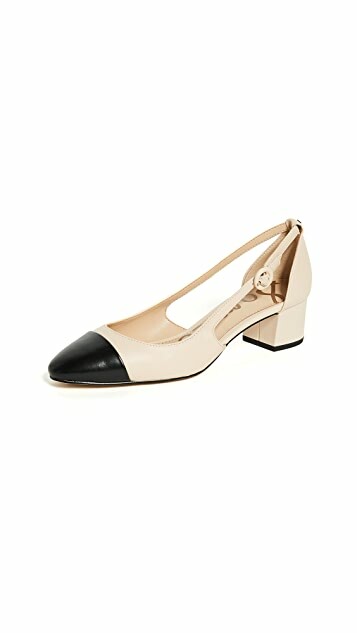 This pair of cap-toe pumps is very versatile and can be worn with both light and dark coloured clothes. 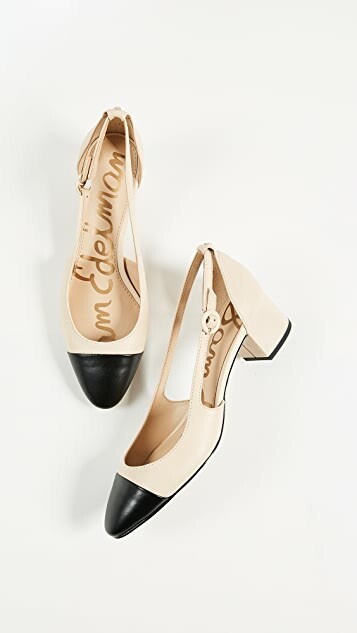 They are comfortable like most other Sam Edelman I own but are loose around the ankles and I always have to walk with care so that they don't slip off my feet. cool and comfortable everyday shoe! I'm usually 8 but when the brand manages half sizes I pick 7.5 so, in this case I order 7.5, great quality, a bit narrow, so I would suggest to go a half size up if you have wide feet, I felt them very comfortable they are cushioned and pretty for everyday at work! This is such an elegant pair of sling. I love the black round toe and my feet are a bit wider. This pair is a little long in my opinion so if your feet are on the narrow side, I would size down. 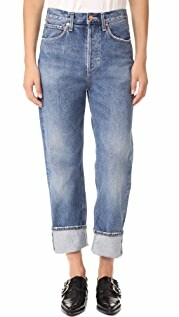 I wear 6.5/7, bought 6.5.